I recently acquired the first disk set of the Animaniacs. I had forgotten how funny the series was. It's not all just bathroom and burping humor (although there is a little bit of that too). It has some very clever social commentary and takes some 'high culture' and presents it in a very silly way. One of my favorite little scenes is from the first episode. In a flashback to the '50s, Dr. Scratchnsniff, the Psychiatrist to the Stars, has someone on his couch. It ends up being Ronald Reagan saying, "Well, doctor, I keep having this dream where I am the President of the United States." Scratchnsniff looks at him, and writes down 'Delusions of grandeur. Incurable.' Had me in stitches. 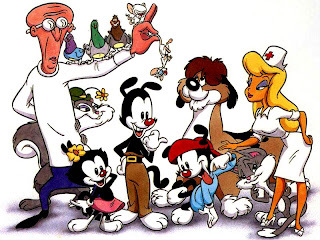 I like a vast majority of the characters - Wakko, Yakko, Dot, Dr. Scratchnsniff, Hello Nurse, Pinky, Brain, and Slappy has grown on me. The ones I can't stand are the Goodfeathers. I just never found them funny. I found them very irritating, actually. I'm going to give them another chance, but, I just want to slap them much like Slappy does with her purse in the introduction each time. We have seasons one and two, and are still making our way through them. I will have to disagree with you about Goodfeathers. I think they are great. I don't think there is a set of characters on there that I actaully dislike.